I’ve long been a casual reader of Barbara Emodi’s blog, Sewing on the Edge. However, it wasn’t until I heard her on the Clothes Making Mavens Podcast that I was excited about the book she was writing, or, truthfully, even heard about it in the first place. When she described the book as being a sort of learning to sew with all the advice you wish you’d gotten, I knew I wanted to check it out. I pre-ordered it, but, since it came in the middle of skating costume season, I didn’t have a chance to finish the book until recently. While Sew… The Garment Making Book of Knowledge isn’t necessarily the sewing book I’m looking for now, as someone who’s been sewing for several years, this is definitely the book I wish I’d had when I started. I think the book has a very logical layout, with the chapters taking you from exploring what and why to sew, to picking out patterns and fabric, to adjusting for fit, and finally to advice about tools and sewing plans. 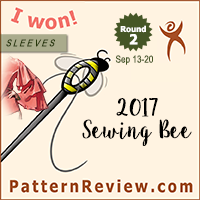 I really enjoy Barbara’s opinions about what makes sewing successful and rewarding, and her attempts to point everyone in the right direction so they can achieve success of their own. Her advice about sewing for your lifestyle takes the main ideas of The Curated Closet and distills it down to a single chapter. The mini-lessons contain some brilliant tips to assist with tricky sewing (like dealing with hems or bulky necklines), and I really wish there had been room for more of them in this book. Final verdict: I think this would be a great book to give as a gift to someone who is new to sewing, or would be a great purchase if you are new to sewing yourself. As for me, I’m holding out for a full book of tutorials, tips, and tricks from Barbara, because I think she has a lot of wisdom to share. As someone who is in that weird intermediate-not-quite-ready-to-be-advanced stage, I’m totally missing books with modern solutions to sewing problems that I run into frequently. I want something that will give me ways to deal with tricky sewing issues that include modern fusibles, cover stitch machines, and sergers, and show me the best ways to utilize them. Honestly, what I’d love to see hit the market is a book with detailed instructions about how to get clean interior finishes, or even comparing RTW finished with traditional home sewing and couture finishes and discussing the merits of each. I think the mini-lessons in Barbara’s book have given me hope that this could exist in a future book, and I really think the home sewing market is ready for something like that. Anyway, long rambling tangent aside, I really like this book. I think it has a fun, modern aesthetic, sound advice, and good tutorials. Although it might not be everything I’m looking for in a sewing book at the moment, I’m happy to have added it to my ever growing sewing library. Since I’ve been obsessing over the many aspects of sewing a wardrobe the past year or so, I thought Athina Kakou’s Sewing Your Dream Wardrobe looked like it could be a handy book to add to the collection. This is a fairly short eBook by sewing blogger Athina Kakou. While I love the idea of making a book about building a capsule wardrobe that is specific to sewing, I felt that there could have been more detail or instruction in this book. I realize that most of the exercises and practical advice is contained in the workbook and sewing planner she offers, but I feel that this book could benefit from perhaps being combined with the workbook. I enjoyed seeing photos of her own self-sewn wardrobe collections, but I feel like it could have perhaps been more helpful to combine the content of the two books and cut down on the photos? It is a lovely book, and a great first publication, but perhaps not as detailed or inspirational as I had hoped. She speaks in generalities to allow for many ideas, but sometimes I felt like this could result in a lack of direction. I guess I was hoping for more tips on how to actually plan a wardrobe, what sorts of garments to include, and how to come up with a theme. I did think her tip about sewing in capsules vs. sewing in collections made a lot of sense, and I really enjoyed the second chapter of the book for that reason. Once again, though, I feel like perhaps I’m coming at this book from the perspective of having thought a bit too much about this topic already. I feel like the majority of issues covered in this book are discussed in greater depth in The Curated Closet, which, as I mentioned above, is summarized nicely in Barbara’s Sew… I don’t think this is a bad book, and I do think the fifth chapter about sewing for pregnancy is quite unique, but, on the whole I felt that this books was probably a bit too general for me. I am, however, looking forward to using her Workbook and Sewing Planner, as I feel these interactive resources will be more practical for me to organize my ever growing sewing plans, patterns, and stash. Oh, there are definitely some cool tricks in there, it’s just that I just want a whole book dedicated to cool tricks because that would be awesome. Yep, I completely agree with you about Barbara Emodi’s book – I think I must be at about the same intermediate stage as you. I love her mini-tutorials and felt that I just wanted there to be more of them. What sets this book apart, I think, is the strong sense that comes across of Barbara as a personality. It’s the most entertaining sewing book I’ve read, by a long way. 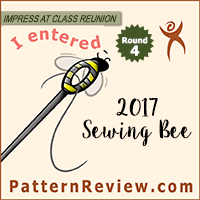 Like you, I’m hoping for a second book from her, with lots more practical tutorials, aimed at the intermediate sewist. I love every word Barbara can write about anything — but most especially her sewing projects and her love for doing each project. Her energy! I get inspired. Thanks for your reviews. I happen to have two of the books you mention, the blogger’s e-book and The Curated Closet. While I like both at first glance, I haven’t had the chance to really dive into either yet. Hoping to now! Hi Dr. T, what is the title of the wardrobe book from either the late 50″s or 60″s that you like so much? It’s called Clothing Construction and Wardrobe Planning by Dora S. Lewis.